I was so excited when I saw this idea. I love my Big Shot and just couldn't wait to recreate it on my own. 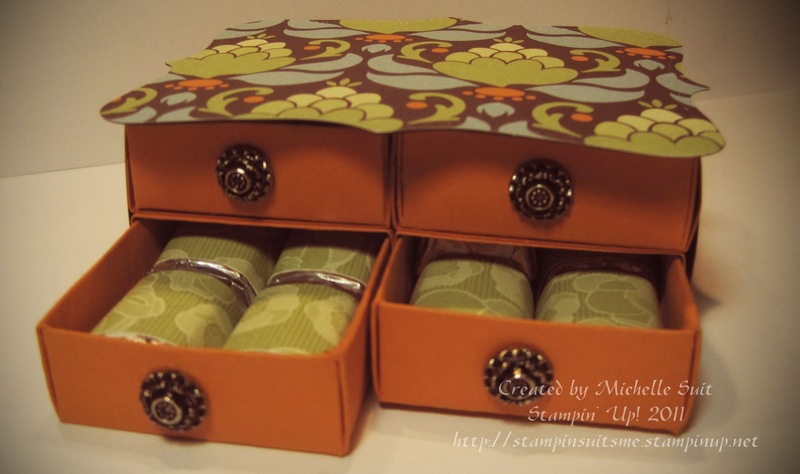 This little dresser is made using both the "Matchbox" and "Top Note" dies. I had a hard time choosing which Designer Series Paper to use and I'm really happy with my choice. The "drawers" are filled with Hershey's Nuggets. Each one is wrapped with a strip of coordinating DSP. I finished the "drawers" off with four of the Antique Brads. You could actually make it as a gift box for any number of gift items. The possibilities are endless!